Patented Science Floats Your Spine In Natural Comfort! Great Fit For All 25 Years In Development. Holds Individuals Up To 300lbs. Hard Or Soft Surfaces Giving You...relief! Today you can join the over a half million BackJoy enthusiasts have already discovered that there simply is a better way to sit. Be comfortable, feel stronger, have more energy, and enjoy life with BackJoy! Can BackJoy help you? If you suffer from back pain, especially when you sit, or you are just uncomfortable and find yourself squirming when you sit for long periods of time, you need BackJoy! 1) BackJoy automatically corrects your posture. You know you are supposed to sit better but its hard. BackJoy does it for you! 2) BackJoy maintains your posture while you sit. Complex science combined with your body weight turns BackJoy into a shock absorber for your spine. It floats your spinal system in a natural cradle of comfort. 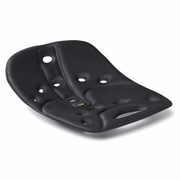 BackJoy constantly adjusts to your body as you sit to keep unnatural pressures and strains from hurting you. 3) BackJoy enganges your core muscles. For the first time when you sit, your core muscles will be engaged. The muscles that are supposed to hold your spine erect can work they way they are supposed to. You feel comfort and will feel refreshed after sitting for hours at a time. Nothing else in the world can do this! Works for all types of conditions.